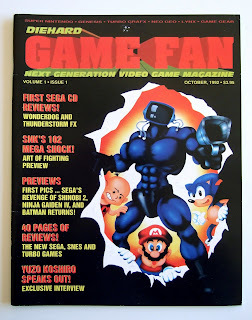 In fact, I was such a die-hard fan of Diehard GameFan magazine that I still have the premiere issue--and it's in pretty great condition considering it's 18 years old. As such, I couldn't help but smile when I read that Dave Halverson, one of the founders of the original Diehard GameFan, is getting ready to re-launch the magazine in mid-March. This time around, the magazine will be "large format" (whatever that means) and "dual cover," meaning it'll tackle both movies and games. I haven't bought a gaming magazine in years, so I doubt I'll buy a copy of the new-and-hopefully-improved GameFan when it hits newsstands next month. Still, I'm glad I could pick it up if I chose to do so. They boy;s older brother has every issue from #1-20, and I keep asking the boy to find out what it would take for his bro to part with them. I actually have most of the early issues of Nintendo Power. (I stopped subscribing after about 5 years, I think.) In fact, I have #1 and #2 with me in Seattle--with the rest being in the basement of my parents' house in Wisconsin.